Riders storm out of Spain in 1702. Elijah and Klaus look for Cole. Elijah had tried to conceal the family, but their debauchery has lead their father to them. Game’s over. Michael is on the way Elijah says. Cole doesn’t want to leave, thinks that since their father has always hated Klaus most that he should run so their father will give chase. Rebecca is already on the ship, she does what she’s told because she fears Nic (Klaus). Finn will do nothing with a dagger in his heart. Cole’s brothers plan to subdue him the same way and he promises to make him suffer one day as Klaus slides the dagger into him. Now Cole is enjoying life in his hot new body and stealing apples as he watches Davina. Bloody paw prints mark the downstairs. Bodies left dead, mauled. The prints lead away turning from animal into human ones. Elijah follows them up to Hailey in the bathroom. Klaus took Hailey out to the cauldron because she was having a crappy day, and Hailey killed them all. Hailey tells him that she did no worse than anything that Klaus has done. Elijah holds her to a higher standard. She has a werewolf temper to go with her new vampire hunger, and a totally bad attitude. At least Elijah still has manners. Klaus admits that he did take Hailey on a witch hunt, but it didn’t start that way. He wanted the witches to find the White Oak stake for him, they couldn’t or refused so he let Hailey have her fun. Elijah thinks that Hailey is falling apart, that she’s growing more savage. Klaus thinks that vampirism just magnifies what was already there, and werewolves are violent creatures. She cannot live up to the pretty little picture that Elijah has of her. Hailey is embracing her new nature, she was smiling during the slaughter, a little less criticism and she’ll be fine. Elijah thinks she deserves more than just fine, tells Klaus to take her to the bayou and find the wolves. Hopefully they can reach her and restore her humanity, her dignity. Gia, the Rocker girl has proven herself to Marcel, she gets to move up in the food chain first. Wait was that Rutina Wesley (Tara on True Blood) in the group trying to become vampires? Or just a look alike? Elijah pays Marcel a visit as he gives his little speech about what its like to feed. Being a vampire isn’t for everyone, for some it brings out the worse. 1821. Marcel struggles with the piano. He doesn’t think he can do it, but he said the same about reading, and now he’s fluent. Marcel wants to play like Elijah though. Klaus is less than pleased that they’re getting along so well. Klaus has been drinking. Rebecca is still pouting over the governor’s son that Klaus killed. He use to have fun with Marcel, but Elijah has been taking up his time with schooling. No one is out having fun with Klaus now, so he pulled the stake from Cole who is ravaging everyone in sight. He hasn’t completely forgiven Klaus, but he likes his apology. Elijah doesn’t appreciate his idea of fun. Marcel is surprised to see Elijah on his side of the river, and Elijah is surprised to see Marcel recruiting vampires. It was all fine until Klaus started mettling and the harvest girl started making moon rings. The Quarter is becoming a dangerous place, and Marcel wonders if he’s come to join him. He hasn’t. He wants Marcel to find the White Oak Stake, and he’ll leave the little social experiment alone. Marcel has no way to get the stake, but Elijah points out that Davina can help. Marcel wants Elijah to stay away from Davina so he’ll have to deal with the manner himself. Michael mocks Davina’s efforts at interpretation. Davina tells him it’s a simple linking spell. Davina just needs Marcel and Josh free so that he can be killed, the rest of the vampires are none of her concern. Michael thinks that he can help her, but Davina doesn’t trust him to not try to free himself. For someone who hates Klaus so much she shares his paranoia. Michael wants Davina to hurry and succeed so that he can be free to kill Klaus. Cole sends Davina a text for a coffee date. He watches her leave to meet him. Ester is right that Davina is hiding something. Her attic was locked tight with a good tight spell Cole reports. She may have a weapon, or something in there, but Ester needs to know what it is. She tells him to invite her for dinner, even though he just stood her up. As they walk into the grave yard, there’s a bevy of wolves there waiting. They all want what only she can give them, moonlight rings. The witches have been working day and night, and soon they will have enough rings to face Klaus and Elijah with an army. She plans to teach them of the unfortunate error of their vampire ways. In the bayou, they find nothing. Hailey told Klaus that they had abandoned their camp. The Harvest girl hasn’t gotten to them yet, and Klaus wants Hailey to find them, to have them align with them. Klaus wants Hailey to lead her pack. Hailey isn’t up to leading anything. She’s a mess, she cries all day and feeds all night, missing her daughter. She asks if Klaus even thinks about her, but that’s all he thinks about, the baby and making those who would harm her pay. Marcel has contacted Davina, but he needs Elijah to split. He’s known his family for a long time, and threats and blood shed follow them. He wants Elijah to stay out of sight, and to not kill anyone. Past. Elijah scold Klaus and Cole about the 46 bodies they drained. It wasn’t just 46 though, they haven’t found the bodies in the attic yet. Elijah cannot keep their family safe if they continue to slaughter everything they come across. Klaus is just trying to amuse himself, he’s surprised Elijah has any time to mother him with Marcel taking up all his time. Elijah wonders if he should send Marcel away for his own protection, but Klaus will not have it. He would rather stick Cole back in the box, than to lose Marcel. Marcel stays. Marcel meets with Davina, it’s a pleasant reunion. Marcel catches up Davina, and she admits that she met someone, but that he stood her up. Marcel jokes to say the word and he’ll take care of him, which he would, but he gets down to business. He needs a locator spell so he can find the White Oak Stake. Davina’s mood sours, she asks if one of them put him up to this. Marcel points out that if its used on Klaus any vampires sired by him will also die. Davina knows, but she’s not handing it over to Klaus or Elijah, both being sadistic monsters. Elijah agrees with her, and Marcel looks ashamed. They both have excellent reason to find the stake. Elijah suggests that they team up, but Davina refuses. The Originals have been in power for too long, and now that time is up. Marcel told him to stay put, but Elijah needed to see Davina for himself. She was too cavalier about Marcel’s safety because she knows where the stake is, she’s had it all along. Hailey watches her pack from the distance. Oliver is acting like the alpha. 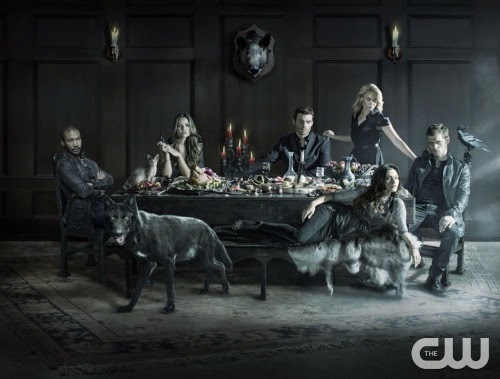 Klaus reminds her that she may now be a hybrid, but her pack mark isn’t gone. Hailey tries to appeal to her people. They need to stand united, and have someone champion them. She would like to be that person if they let her. Many of them would rather die than align with her. Oliver’s attitude gets Hailey angry as he calls her a blood sucker and worse. Klaus wishes to rip off his head, but Hailey stops him. She may not like Oliver, but he’s family. Hailey proves to be a more level headed and benevolent ruler than Klaus. He leaves her with her kin as he goes looking for Cassie (Ester) to let her know the rules of his city. Marcel is sure that Davina will not use the stake on Klaus, but there’s nothing keeping her from staking Elijah. Marcel will get the stake from Davina, it’s only a matter of time. Elijah will have the stake sooner than later. He’s not the only one looking for it, and he won’t let it fall into another’s hands. Marcel is surprised at Elijah’s rashness. His family has a great deal of enemies because of their heavy handed methods, he’s surprised he survived them. Past. Cole forces some people to put on Hamlet. He snaps the neck of a man who gets his lines wrong. Elijah sees that there is no end to Cole’s depravity. Cole knows that if Marcel is to be a vampire then he’s going to have to become accustomed to this life. He’s already given Marcel his blood, now all they need do is snap his neck. Klaus tells Elijah to release him, and he stabs Cole himself. Elijah doesn’t fault Marcel’s suspicions or Davina’s contempt. It doesn’t alter their present dilemma though. Michael paces the room, but so long as she has the bracelet he cannot harm her or break free. Caleb makes dinner plans to make it up to Davina. Klaus calls out Cassie, and gets welcomed by a huge group of wolves. He’s looking for Cassie though, he wants to see the witch who’s been crafting the moon rings. Cassie steps out from behind her army and makes her presence known. Cassie pours Klaus some tea, offering her condolences for the loss of his child. It was her coven that was behind the whole killing thing, and who are behind the rings now. The witches and wolves were once at peace until the vampires came. They have no humanity. Witches have a coven, wolves a pack. They are everything that the vampires of forsaken. The rings level the playing field. Klaus warns that there are dangers at every turn, that no one is safe. Cassie knows that, and she’s taking precautions as they speak. Caleb gets Davina to open up, and opens up to her. He has an overbearing mother, she’s the reason he stopped practicing magic for so long. She’s surprised to hear that he’s a witch. He didn’t just ask her out because she’s gorgeous, but also because she’s famous among the witches. Davina has to take a call, and Finn takes a seat. Cole teases that its creepy Finn watching Cole on his date. But Finn wants him to cut the flirting and find out what Davina is hiding. Cole needs his charm and personality to get the information out of Davina. If he has to Finn will provoke her to use it. Davina tells Marcel that she never said that she had the stake. Elijah thinks she does, and he’s sure that people will be coming for her. Davina is willing to take that chance. She goes back inside for Caleb, but he’s getting ready to leave. The place is shutting down for a private party. The partier tells her that she should stay, as his friends close in, but Davina uses some of her magic, and the man goes down. The others don’t like her little trick, and she can’t use it on all of them at the same time. He goes to attack Davina, and she falls to the ground. Caleb tries to stop the man, but finds himself thrown across the bar. The wolves close in on her, and Davina releases her weapon. Michael leaves the room, and comes to Davina’s rescue. He kills and maims the wolves, but in the scuffle, one of the wolves knocks Davina’s bracelet from her wrist, making her vulnerable to him. Michael grabs Davina. He’s going to enjoy eating her. Elijah arrives in time to save Davina. He throws Michael before he realizes who he is. Michael had hoped to run into Klaus first. As Elijah holds off Michael, and nearly gets staked, Marcel tries to get Davina out of there. Davina has him retrieve her bracelet so she can control Michael yet again, and he does. She sends Michael home before following him, leaving everyone else behind. Klaus drinks the tea Cassie offers, it reminds him of his insane mother. She thought they were abominations, but she was the true monster. She stole their innocence, made them vampires, and then made them out to be the villains. She asks if there was a question. Before she died, a witch revealed that the coven was under his mother’s influence. He asks if she speaks to her now. She doesn’t have to, if she were there she would tell him to go to his room for being so rude. Klaus is upset by her words, and the wolves rush in. He could kill them all, but she points out that he would be murdering members of the very pack he hopes to someday lead, and there’s no need for bloodshed. They can resume their discussion another day. Klaus tells Elijah that it is worse than they thought. He looked into Cassie’s eyes and she isn’t just guided by their mother, but she is their mother. Elijah has worse news. Their father is back in the flesh, and he holds the stake, enslaved by Davina. There’s only one question of Klaus’s mind. Which of their parents do they kill first? Hailey brings home her pack, and Klaus isn’t happy to see they have guests. They’re under siege. Hailey points out that if they aren’t with them, then they’re with the witches. Past. Klaus finally acted solely in the best interest of another, surprising Elijah. Cole’s retched behavior will only stray Klaus. Elijah must make sacrifices if they’re to preserve the bond between Klaus and Marcel. Marcel gushes over learning of a passage, and Elijah calls Klaus to remove him, telling him that he’s bored with him. Marcel is crushed, and Klaus swoops in to comfort him. Klaus notes that Oliver was not among the wolves. He’s off to pledge to Cassie, but he will report back to Hailey everything that he learns. Klaus is proud of her. Elijah slips down the stairs, and leaves. He thinks that Hailey should be with her kind. Poor Elijah making more sacrifices for Klaus. Cole isn’t pleased with how Finn handled things. He was nearly killed in Finn’s plot. Ester knows, she gave the order. Cole is going to have a scar on his pretty face, which he isn’t pleased about, but he’ll live. Ester figures that Davina will come to him, and try to make it up to him for putting him in danger. Cole hates the plan, hates it all. If this is the grand new life Ester planned, then Cole wants no part of it. Ester reminds him that he’s there by her grace, and he will remain so by her grace. Cole is clear, and Ester looks over what she did to him. Finn was in the attic during the attack and saw nothing. Ester wants to know what the weapon that Davina had was to take out a pack of wolves. Cole claims to have been knocked out the whole time, he didn’t see anything he says. Elijah has men out looking for Davina. He asks if Marcel had any clue what Davina was up to. A vampire that hunts vampire isn’t a good idea no matter how you cut it, and Marcel had nothing to do with it. Everyone is divided, but they don’t have to be. Klaus is on Team Wolf, and Marcel needs to know where he stands. Elijah doesn’t play teams. Elijah can turn his back and side with his brother, but he’s not a wolf, and he never will be, but he can be a part of team vampire. Marcel snaps Gia’s neck, leaving her to be mentored by Elijah, hoping that he does a better job with her than he did with him.